New Delhi became the capital of British Raj in 1911 when the King George V and Queen Mary coronated the new capital after being shifted from Calcutta to Delhi, henceforth called New Delhi. The Coronation Park still exists as a memorial of the coronation ceremony, one of the many historical monuments of Delhi that we keep visiting to know about this city that has lived many lives, has seen many kings come and go. Rashtrapati Bhawan (formerly known as Viceroy's House), Rajpath leading to India Gate, Janpath and Connaught place and Parliament House etc are the buildings that were built by Edwin Lutyens after New Delhi became the capital. That part of Delhi is still called as Lutyen's Delhi and is surrounded by a thick swathe of green including acres of Presidential estate, Nehru Park, Lodhi Gardens, the National Zoological park, Humayun's Tomb etc. The Imperial is one of the oldest and grandest hotels in Delhi located at Janpath road. It is almost like a gem hidden into the chaos of Japath market. But once you step into the lobby and walk past the corridor, you see precious memorabilia from the past and get lost in the serenity. 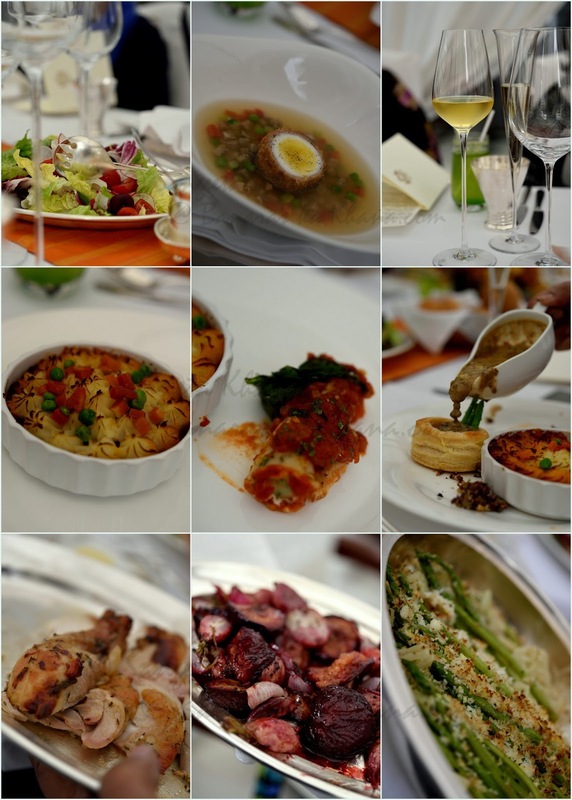 Chef Prem Kumar Pogakula (Executive Sous Chef,The Imperial) along with his team has curated the 'Delhi Durbar ki Daawat' to revive the flavours of coronation ceremony of Delhi Durbar. Hotel's GM and senior executive VP Vijay Wanchoo has also contributed in this curated experience of Delhi Durbar ki Daawat. At the media preview he kept talking about old recipes, ingredients the old banquets, the art the hotel owns and how the hotel has preserved it's original structure. The dawat was set up in a plush white canopy, the table resplendent with the finest wine goblets and champagne flutes, salads and irresistible bread rolls. Welcome drink was brought in as soon as we took our seats. Reading the curated menu placed on our table, it was evident a lot of work has been done to recreate the banquets of the bygone era. Scotch eggs and broth came to the table first with chunks of lamb, vegetables and pearl barley, half a scotch egg sitting pretty in the bowl. Delicious flavours and textures enriched by barley that I love in my soups. Vegetarians had a Mulligatawny soup, Mr Vijay Wanchoo who became vegetarian later in life told how this soup has Srilankan origin but became so popular with British. Shepherd's Pie came reminding of how simplicity is the best virtue. The pie was made in individual portions and was melt in the mouth creamy, the mince below was delicious, succulent and rightly spiced. The potato crust browned beautifully, it was a stunner. The vegetarians had Vol-au-vents, the French stuffed puff pastry that became the favourite of the British. It was served the old fashioned way, a delicious brown lentil sauce poured over them while serving. I had a small bite and loved it. The brown lentil sauce is worth mentioning as it was just so creamy and delicious I took second helping of the sauce. Vegetable polonaise, a classic vegetable main course dish of 1900s came next. Made of Asparagus spears, cauliflower floret, breadcrumbs and herbs it was an interesting baked dish that I liked a lot. Baked vegetables retained their crunch yet baked enough to get cooked and get delicious. Pannequets, vegetable stuffed thin pancakes smeared with tomato and deep fried spinach leaves was delicious as well. It was wonderful to witness old classics being recreated. Bubble and Squeak was an old recipe where the cooks used up the leftover vegetables to make potato cakes that was served as a starchy main course dish with meats. It looked like alu tikkis and I would like it with some grilled meat for sure. Creamed spinach charmed everyone I guess. Well made and so very creamy. Interestingly, while I was researching about culinary heritage of Banaras last year I got to know that the family of the King of Vijayanagar, who have a palace in Banaras too, loved creamed spinach a lot and it was a regular on their family table. I loved the Plum and Cherry roasted free range chicken. 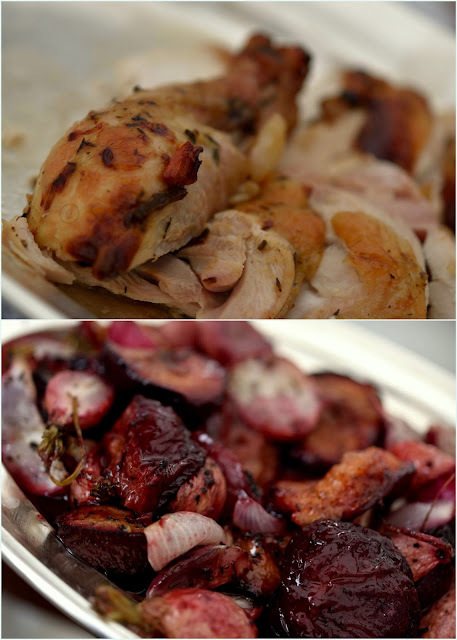 The roasted fat plums along with root vegetables and onions was a masterpiece in itself, chicken was incidental although well roasted and succulent. I just loved the use of roasted plum, the flavours mingling so well with root vegetables. 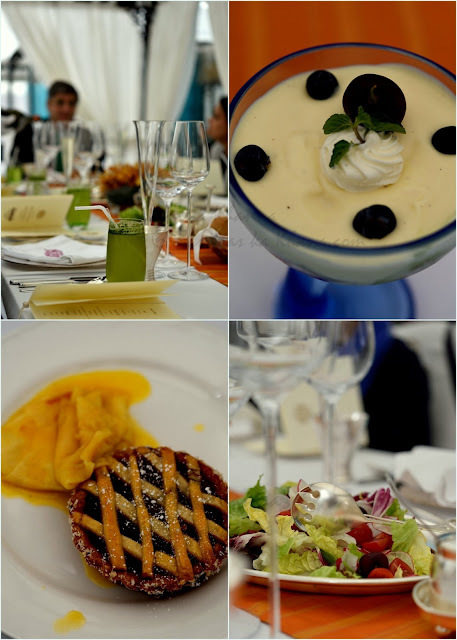 The desserts included Rhubarb Pie, old fashioned Trifle and Crepes Suzette. The Rhubarb Pie was beautifully done, the Trifle really good and some of us polished it off even though it came in a really large serving. What I loved the most was the Crepe Suzette, a very thin crepe folded and doused with orange sauce and flambeed. It was supposedly the favourite dessert of King Edward VII of the United Kingdom, for the right reasons I believe. Very delicate and very flavourful. It is interesting to see how British took influences from all the countries they colonized. The French and Scottish influence is quite obvious but how they took elements from India, Burma and Srilanka during the colonial times and even later, is a story that I would like to dig in more. Thanks to Mr. Vijay Wanchoo, Chef Prem Kumar Pogakula, Ruchi Jain and Aparupa Ray Ganguli for giving us a peek into the culinary history. Most of these dishes are still made in their classic form too, but the small variations and even some fusions have occurred in the past century that gives us an idea how the availability of ingredients due to globalization influences the cuisines. 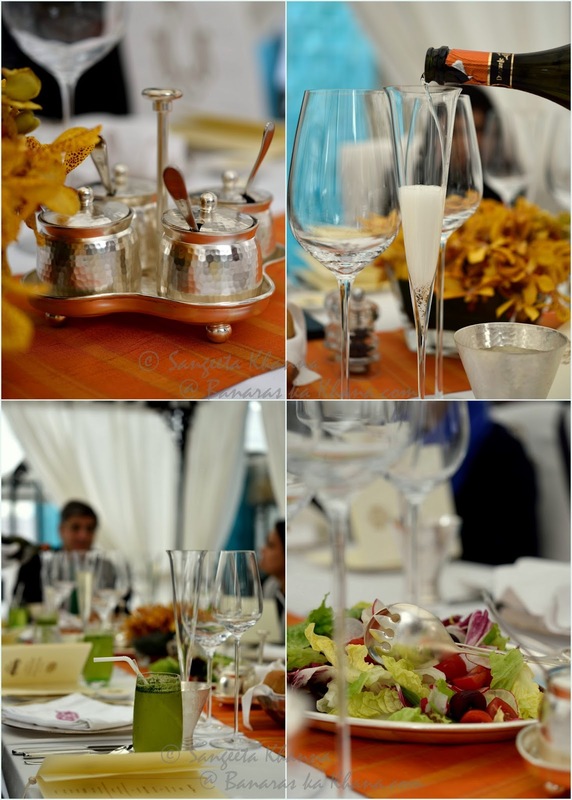 Durbar Ki Dawat is on till December 17th so hurry up and go have a glimpse of a table 100 years old.